This makeshift armor is made by stripping enemy�s armor plating and then put onto vehicle�s damaged hull or body by patching it up. It is found by the group of survivors which their arms is consisted of wheeled vehicles. Most of the vehicles are taken from individual cars to public transportation like buses. As they are not military produced, the survivors modified them by adding several armor plating to increase their durability, on which the survivors call their vehicles as �technicals�. However, coating the whole parts of the vehicles will slow down their speed. I saw few patched up, welded, crudely plated/planked/boarded vehicles or so in the movies, games, sightseeing, and comics/mangas. You are piloting Death Whisper Artillery, for example. DWA is the only Advanced Unit with the lowest Armor Point and of course, an attack from weapon with high damage, used together with Mods, Merits, and Commands, will destroy DWA in one hit. Indeed, you will normally add Natural Armor Acti on it to increase its AP. However, the Acti can only add DWA max AP by +10 and it contains few charges. Therefore, you need buildings like Acti Recharger - Small and Acti Recharger - Medium but they both require you to be Paid. Acti Master Merit is indeed helpful but fares not much better (it takes 20 turns to restore 1 Acti charge). You need something �special� when you are in critical condition. Here it is, my idea of this Scrap Armor Acti Mod. It works like this: when you destroyed a Bandit�s Battle Axe Meka II, you will see the remains on next turn. When new turn arrives, you move to BAII�s remains. When you are in same square as BAII�s remains, you activate the Acti, and thus, your DWA gets max Armor by 60. How? As its ability says, the DWA�s max armor is increased by total number of remains� max armor by 50%. To put it simply, your DWA gained additional 50 max Armor, since BAII has 100 Armor. It has drawback though. When the Mod is activated, the DWA�s Max Speed reduced by 1, since plating the hull and other parts will cause weight add. The Mod has no minimum Max Speed. If there is any, it will be only one, but considering the nature of lifting the heavy weight, it may slow you down and even rendering you immobile. How about the BAII�s remains? It is salvageable, but its chance of salvaging it is very low, pretty much like low salvage chance if the unit is destroyed by an overkill attack, as the whole armor of that remains is stripped down to nothing but hydraulic and mechanical frames. 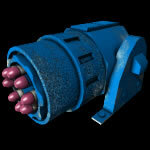 Its blue base color is repainted in orange (similar to other Bandit Turrets). 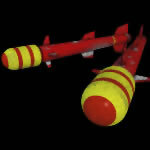 A missile weapon which raider groups fond of due to its impressive and deadly warhead. Its white base color is repainted in orange (similar to other Bandit Turrets), and its red stripe color is repainted in gray or black. 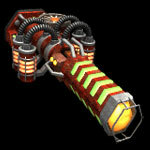 Equipped with special sensor that is able to make difference between friend and foe on the tips, the Bruiser is able to launch its missiles against non-friendly units, especially Bandits. Both Bandit Missile Turret and Bruiser Missile Launcher Mods work in similar fashion with other Bandit Turret Mods, deal more damage against bandits. This signet is given to pilots whose their piloting skill is below than average. The idea of making this signet appeared when the battalion called Red Sun Warriors, which composed of militias and irregulars, facing a large raider group. Since Red Sun Warriors only has few experienced pilots to use high-tech vehicles, the rest of vehicles remained in hangar unused. The battalion also has not found the way to reverse engineer the vehicles to be used by all pilots. Some high-ranked officers feared that their vehicles might fall to the raiders� hand if they made their way to capture them, so one of officers proposed the idea for letting the inexperienced pilots to use the vehicles as they assumed that inexperienced pilots� clumsiness could be useful for destroying the vehicles, since the officers have decided to destroy the vehicles of theirs than letting them owned by raiders. People who want to get the car therefore have to go through driving skill test in order to get the driving license before driving the car. Since I don�t know much the symbol that marks the beginners in driving test according to global standard, I use the mark from Japanese one instead. And here it is (the symbol has been pictured above). I found this mark on Wikipedia. The idea itself was inspired from certain manga or game that I read or played. However, the post talked about the device which adapts the control of the units, so I try to �make� something unique, kinda like by making analogy between the game�s vehicles with real life ones. This Mod is OP (overpowered), you say? It is kinda like a double-edged knife for me. Some vehicles with high complexity require Crew with higher piloting skill. For example, Gunslinger Meka. It requires Crew with Skilled Piloting skill, but not Crew with Rookie Piloting skill. The Crew with Skilled Piloting skill can also use Python Heavy Hovertank. The differences amongst the vehicles are: Gunslinger Meka is Simple unit while Python Heavy Hovertank is Intermediate unit. The stats between these two differ greatly. Gunslinger which has low stats can be easily crushed by Python. You must be wondering what �rank stacked� does mean. Well, it works like this: You have Gatlinger Meka in your hangar or storage. All of your Crews with Elite Piloting skill have been assigned to other units elsewhere for certain purpose, only to leave you with untrained or recruited-recently Crews, for example, Level 3 Crew with Veteran Gunnery skill and Rookie Piloting skill. As we know, Crew with such level and skill is unable to pilot Gatlinger Meka as it is a unit with Advanced (or Elite as by now) complexity, and therefore, it requires Crew with Elite Piloting skill to use it. When you add Signet of Beginner Mod onto your Gatlinger Meka, any Crew with low Piloting skill, from Rookie to Veteran Piloting skill, can use the meka, with some penalties. Crew with Veteran Piloting skill can use the Gatlinger; however, once deployed, the meka gained less speed, less weapon damage, and slightly penalty to hit. Fortunately, the Gatlinger Meka is piloted by Crew with Veteran Piloting skill, so the reduction isn�t pretty much terrifying, but the case will be different if the meka is piloted by Crew with Rookie Piloting skill; the Gatlinger will gain lesser speed, lesser weapon damage, and more penalty to hit. Command units if added with this Mod, they can be piloted by Crews who don�t have Battlefield Promotion Merit, much like a Commander Crew with Army of One ability, but the Command units which added with the Mod gain more penalties and reductions than Non-Command units. Tychus Findlay: OK. Flashy red button, what do you do? Tychus Findlay: Damn. That's hot! My comment: Well, in Findlay's case, the Odin is indeed has been already designed to carry more firepower. It isn't equipped with self-destruction mode, so I can say that he has luck of some sort. However, certain unit DOES have self-destruction mode once the red button is hit, so yeah, count down time before goes "boom". This will become a serious problem if the unit is controlled by rookie pilot. A conventional type of cloaking device that serves armed forces during Jungle Warfare. The material used to make this �ghillie suit� is not expensive, not environmental hazard, and easy to produce. This cloaking device utilizes better camouflaging application as it is able to cover any friendly units nearby. The Camouflage Packs is used when force assigned for scouting and stealth missions. 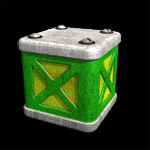 Effect: If unit did not move last turn, it gains cloaking. Friendly units in same square gain this ability if did not move last turn. The idea of producing this kind of armor appeared when biology scientists studying a lizard that able to change its own color to blend in with environment while it is looking for food. One of scientists who has close friend that works in military proposed the idea to make such tool which imitates the lizard�s ability, by combining cloaking device, sensor, and armor plate. And thus, this new armor type is invented and produced as prototype called �Chameleon�. The reason why I make the Mods is that I get bothered by these advanced camouflaging Mods which using charges (both Nightshade Cloaking Device and Dark Shadow Cloak Generator Mods); also their annoying restricted usage (having 0 Cloak Speed). For, Chameleon Armor Mod, it's inspired from James Bond Agent 007 movie (Die Another Die) in which scene shows that James Bond�s car equipped with cloaking device. In certain movie, game, or comic (manga), there is a scene that portrays protagonists are in the middle of derelict vehicles or remains. After the protagonists take few steps, the derelict vehicles or remains are started to move and begin to attack the protagonists. Most likely, the vehicles are composed from salvaged parts which have been improvised with other technology. Camouflage Kits enables unit to gain cloaking if did not move last turn. The Crew of the unit will hop out from its vehicle to mask it with camouflage equipment (large ghillie suit maybe). The unit is also remains cloaked, even if it launches an attack. Unit will only uncloak if moved last turn. Camouflage Packs Mod behaves like Camouflage Kits Mod, except that Camouflage Packs can cloak multiple friendly units in same square. It also has similar weakness to Camouflage Kits. Chameleon Armor Mod will enable any unit to gain Cloaking Speed, without having to use some charge. It also make the unit remains cloaked, with cost, its Armor Points is reduced by certain inch. Its base color is olive (similar to Plasteel Armor�s color) and its glowing color is light blue (similar to Buckler Light Shield Generator�s blue core). It has no blue/cyan rust stains. A new defense modification invention which is made by combining basic shield generator and basic armor to increase vehicle durability. Its base color is brown or copper and its glowing color is light orange. It has no blue/cyan rust stains. No one knows how this kind of defense system is made. Apparently, the Bandits have either salvaged the remains of the force they killed and reverse engineered the technology or sent their agent to steal it. Even so, its quality is inferior compared to standard one. 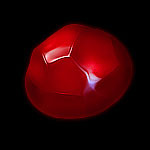 Its base color is gray (similar to Steelcore Armor) and its glowing color is red. It has no blue/cyan stains. A new defense modification invention which is made by combining improved shield generator and improved armor to increase vehicle durability. Its base color is blue (similar to Pro-max Armor) and its glowing color is green. It has no blue/cyan stains. A new defense modification invention which is made by combining advanced shield generator and advanced armor to increase vehicle durability. 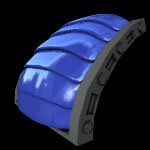 Its base color is blue (similar to Pro-max Armor) and its glowing color is purple. It has no blue/cyan stains. A new defense modification invention which is made by combining both ultimate shield generator and armor to increase vehicle durability. Its base color is orange (similar to Triage Battle Armor) and its glowing color is light orange. It has no blue/cyan stains. An upgraded version of Triage Battle Armor, Triage Battle Hull has a shield generator integrated in it to make the vehicle able to stand chance against incoming attack. The Mods are working in similar fashion with Shield and Armor Mods, to increase Shield and Armor Points by certain value, however as the hull is made from combined shield and armor, its value is reduced by half. For example, Leopard Assault Tank. It has rather low Shield and Armor value points, even though it has ability to take less 25% damage from Meka attack. 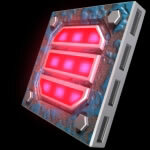 You will either add Hightower Shield Generator or Pro-max Armor Mods, to increase certain value of Shield or Armor, but will leave the another value unaffected. Adding them both (for example, you already add Hightower onto it and then add Pro-max) will cause space wasting for other Mods, like Superior Grade Ammunition, Steeltec Repair Droid, and other Mods that you desire to put on. So, this Hull Mods will settle the score, add both Shield and Armor value of the unit you are going to use. It has light sky blue for base color instead of red one. A crystal that contains mysterious power after it has been through several refinements. It is said it is capable to stop the vehicle by emitting zero degrees beam as well as entrap the pilot inside, while the pilot is unable to launch a counter attack against the attacker. It is also said that the crystal is able to freeze any organic life form to death. Filled with cryogenic compound, this ammunition is able to slow down the target while also rendering it incapable to shoot back. Cryogenic Ammunition is also proven to be very deadly when used against animal. It has light gray for base color and light/sky blue for stripes color. 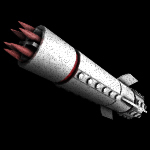 Missile shells filled with nitrogen which is designed to freeze enemy unit on impact. Its blast is also capable to encase any living creature in cold shell. Ice Crystal Prism: Batman & Robin, a 1997 year movie. Mr. Freeze freezing weaponry, powered with diamond and other transparent gems which have same properties. When hostile unit is hit, like the ability said, it will be slowed down. Hostile unit's weaponry will also be frozen as the cryogenic compound, hydrogen compound, and crystal energy hit its weapon firing mechanism. Especially against energy armed hostile unit, its energy weapon recharge is reset (except if hostile unit has 1 energy recharge from beginning, like the Sunburst Meka which has 1 energy recharge). The Mods if added to certain unit will deal more damage against Sha'Kahr unit. Its orange base color is repainted in black/dark grey one. Its green-glow color is repainted in red-glow one. A powerful energy weapon which able to vaporize any material in a blink of eyes. Due to large number of components used to make this weapon, it slows down any vehicle that using it.